Are you hoping to grow your local business through networking, getting to know the Woodinville community, having someone to advocate for your business at City Council, looking for other promotional opportunities, or do you simply want to support the local economy in Woodinville? Then you’ve come to the right place! Did you know? A national survey of 2,000 adults conducted by the Schapiro Group showed that 80% of consumers were more likely to purchase a product or service from a Chamber member. The study shows that joining a Chamber is an effective business strategy because consumers believe that such companies use good business practices, are reputable, care about their customers, and are involved in the community. We agree! learn more about our Committee HERE. 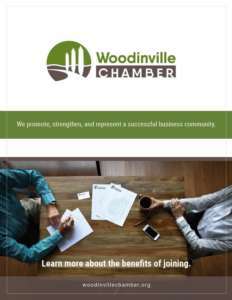 Chamber Website Business Listing at www.WoodinvilleChamber.org, including social media links! Check out our member directory to see what your listing could look like! Referrals: Our staff proudly recommends Chamber Member Businesses first to all visitors and call-in inquiries. We are your pro-business advocate representing the needs of business on all governmental fronts through researching local, state, and national issues that impact business and aggressively lobbying pro-business positions. We ask members to add their voice to the lobbying efforts of the Chamber. We form key business partnerships with organizations to expand their voice on critical issues. We educate our members through newsletter articles, key speakers and membership programs. We support, develop and lead economic development advocacy programs that address zoning, planning, transportation, and infrastructure needs designed to strengthen, promote and expand Woodinville. The Chamber strives to maintain productive and respectful relationships with elected officials and staff at all levels of government, with a priority on Woodinville City Hall. The Chamber attends City Council meetings and regularly meets with the City Staff, Woodinville Council members and State and County politicians to discuss issues that are important to the business community. Local Business and the Woodinville community are intertwined. A strong business will do well to survive if it is a part of a strong community. By participating in the Woodinville Chamber, you are showing leadership in the business community and beyond. By contributing to the positive economic growth of our Chamber community (by joining as a member) and supporting other local businesses, we can all create positive momentum. Think Local! Joining the Woodinville Chamber helps ensure that your business community can continue to move forward and thrive. We appreciate our members for their support.